Standard Setting: The Renegade Heavy Blaster Pistol, built by SoroSuub was reportedly the Second most powerful stock Blaster Pistol sold on the market. The Model 557 retains its predecessor’s fearsome firepower, range, and ammunition in a sleeker, lighter model using updated galvanized circuitry and Kyber focusing crystals. Stun Setting: A stun setting was also added to the Model 557. Powerful Output: The standard bolt from the Model 557 is equal to the reportedly second most powerful blaster pistol sold on the market, making for a heavy punch and trimmed down design. Soaking Up the Magazine: The disruptor setting on the weapon uses 10 bolts from the cartridge, drastically reducing its ammunition capacity. Reduced Range: The Disruptor setting reduces the effective range of the weapon and decreases the relative accuracy of the bolts. 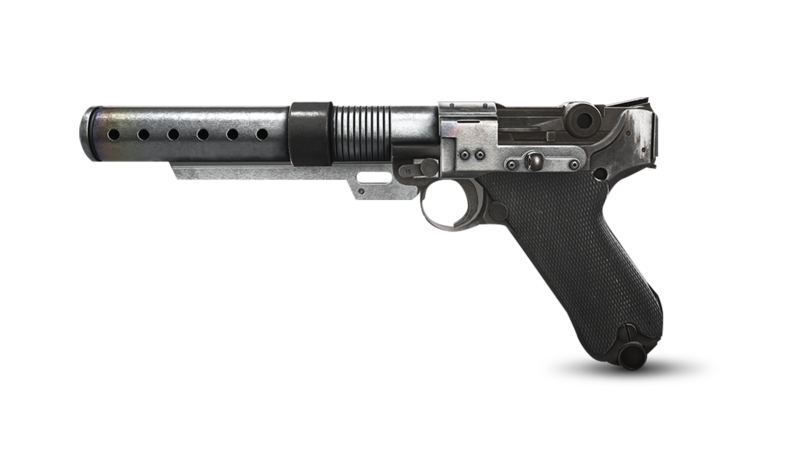 SoroSuub, Merr-Sonn Munitions, and Blas-Tech competed to produce the “Ultimate Blaster Pistol” during the age of the Galactic Empire under Emperor Palpatine, resulting in the T-6 and the Renegade blaster pistol models being produced. The Renegade was reportedly the second of the two, with the T-6 ultimately firing more powerful shots, however the Renegade was popular among spacers for its slimmer design, expanded ammunition capacity, and greater range compared to its cousin from Blas-Tech. Following the creation of Sonn-Blas Corporation, a subsidiary merger of the two companies and the armament explosion of the Post-Gulag Plague era, the Renegade maintained use in limited capacity. Mostly among spacers or individuals unaligned with the weapons manufacturers associated with the rising and falling governments of the Galaxy. Sonn-Blas began to develop a modified and updated version of the Renegade, the Model 557, with a trimmer, sleeker design based off the Blas-Tech A180 blaster pistol. Using updated technology, wroshyr wood grips, a cautionary pulser in the grip, durable bronzium components, and purified kyber-based focusing crystals, the new blaster was able to host the new look and maintain the power and punch its predecessor had become famous for. Disruptor and Stun settings were included, using more of the ammunition cartridge for the more powerful blast setting. Disruptors, having been given the reputation for disintegrating their targets were designated seperately from Blaster Pistols, however, Sonn-Blas wanting to claim one of its product line as the “Ultimate Blaster Pistol” felt the need to provide its customers with a weapon capable of competing with disruptors already on the market. The Disruptor setting has issues with accuracy at extended ranges and suffers from a reduced range compared to the Renegade’s gold standard, but it has the capability to turn a fully grown wookiee into a pile of ash. It also absorbs the energy of ten blaster shots to produce the bolt, drastically reducing the ammunition capacity the original Renegade was preferred for. Edited by Laira Darkhold, 10 December 2018 - 01:41 PM. Since you have the Range listed in hard numbers for the normal blaster function range, How much range does the disruptor have roughly? I literally have it listed in the same hard numbers and rating format. Its already included in the sub. Laira Darkhold, I must have missed that. Sorry for that. Remind me not to work on submissions as soon as I wake up.